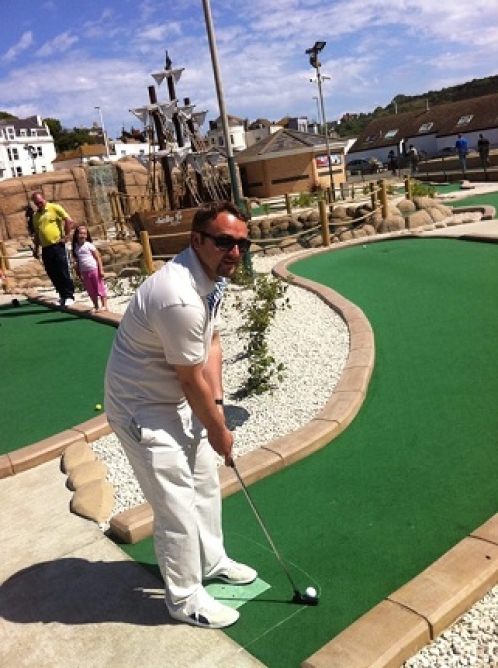 Minigolfnews reporter Steve Lovell took some time to chat with Lavdim Zylfiu who was one of the parties primarily responsible for bringing the World Adventure Golf Masters to Kosovo in 2016. This tournament was well received by all and as Lavdim notes, saw the return of the USA to international competition for the first time in 15 years. You can see read our recap of the event in this article. Lavdim provides some insight on how minigolf got rolling in Kosovo, the work that went into getting the WAGM and the impact of the event. Thanks again to Steve and Lavdim for the interview. Minigolfnews (MGN): Hi Lavdim, tell us a little bit about yourself. Lavdim Zylfiu (LZ): My name is Lavdim Zylfiu, I live in the Kosovan capital, Prishtina, with my mum, my wife and my son. I am President of the Kosovo Minigolf Federation, selector and player as well. I have spent the last nine years of my life dealing with the sport minigolf and golf, helping create the foundation of these two sports in Kosovo. MGN: How long have you been interested in minigolf? LZ: I started to deal with minigolf from 2009, after some long discussions that I had with my boss, Dino Asanaj, who was a founder of Prishtina golf, minigolf and golf driving range located outside of the capital. This was also first initiative to bring these two sports in Kosovo. MGN: Your first international tournament was the World Adventure Golf Masters in Hastings, England, in 2011. How did you hear about it? LZ: Exactly, I remember it very well. When we finished the first season at the course in October 2010, I was sitting with Dino and discussing creating the Kosovo Minigolf Federation. From there, I started to search more and more about minigolf competitions on the internet, where among much information I found, I saw that there was an international Championships on the MOS system at Hastings. I will never forget my first participation in a minigolf competition, my first round of playing, and my game, being among the three best players after the first round and making four aces in a row at the Pirate Course. MGN: You have played in two other World Adventure Golf Masters, in 2012 and 2014. What was it about those event that you particularly enjoyed? LZ: Yes I did. In 2012, I was a part of the WMF All-Star Team where I helped win the bronze medal, which was my first medal and Kosovo�s first international medal too. Hastings is always nice and I miss that town and people in it. I remember it was raining all the time and I could not play as I wanted, but I got back home with that medal which I dedicated to Dino, who taught me to take first steps. In 2014, I was in Gothenburg with my colleague Sabri Maloku and I had also very good time there. I remember that I saw myself playing in the minigolf catalogue and our course made by from City Golf Group, among ten other courses from Europe. This was the moment that I started to talk about the possibility to bring the WAGM to Kosovo for 2016, so I started to work on it in Sweden. Gothenburg is very nice city, same as people in it. I will always remember this city as the place where I started to make WAGM 2016 in Kosovo possible. MGN: When did you first get the idea that you wanted Kosovo to host the World Adventure Golf Masters? MGN: Try and describe, if you can, how much work you had to do to get the WAGM to Kosovo. LZ: The fact that I was the first to start work in the field after being organiser while building the course, to learn first steps, create first minigolf club in Kosovo called First Block, from the neighbourhood where I have grown up in Prishtina. Also, I created four other clubs to make the total of the minigolf clubs in Kosovo at five, discovering new players who were beginning the sport, dealing with all the paperwork about the Kosovo Minigolf Federation, write all the necessary projects and finding 99% of the financial support, having more than fifty media appearances, giving lectures to a few thousand people, getting around fifteen visas to travel around Europe, winning a bunch of medals as coach, including gold, silver and bronze medals. During this time, I had to maintain the course for six years, convincing so many countries, including the USA national team, to come to Kosovo and at the same time, to be organiser to the world�s main event in 2016 about minigolf, at maybe the best MOS system course in the world and taking third place in the world on the game while stepping on the floor with two strongest teams in the world, Germany and Sweden, I think it says a lot for the work I did it since 2009. MGN: When did you know that the tournament was finally going to be played in Prishtina? LZ: At the WAGM 2014 in Gothenburg, I spoke with Sport Director Pasi Aho about giving me the chance to bring the WAGM to Kosovo and he give me one hundred days to see if it could be done. I had a meeting with Aferdita Fazlija, deputy sport director in the Kosovo Sports Department, and I told her about the possibility and the money support that we needed in order to organise a world event. She told me, �Lavdim, go ahead, you will have our support.� At that time, we had no government and I could not talk to the Minister of Sports directly, even though I wanted to. With the continuing government problems, I needed extra time to get prepared and make the proposal. On 27th of October, 2014, together with board member, Kushtrim Vrajolli, and the owner of Eko Invest Company, Bahri Asllani, who was a sponsor in this very important trip, we took flight to Bamberg to make the last discussions with President Dr Gerhard Zimmermann and Pasi about bringing the event to Kosovo. I wanted to do something like what I saw during my all travels since I started to play, mostly from Bud Munder - Germany 2012. I remember I spoke a lot, the President was watching me and asking me �are you sure about what you are saying,� but he trusted me a lot. They gave me sixty more days to get prepared and on 28 of December at almost 11 pm, I sent the project to Pasi. At the moment I sent the project, I made an announcement on Facebook about it. I don�t know why, but I was pretty sure that we would get the right to organise the WAGM 2016, being the first country in the Balkans who will organise such an event. MGN: At the opening ceremony, it would have been the first time for you to see all the competitors together. How did you feel at that moment and did you get a chance to relax during the tournament? LZ: I have had remarkable moments in my life, but the opening ceremony of WAGM 2016 will stay in my heart and my mind until I die. Since April 2015, when it was announced that WAGM 2016 will be played in Kosovo, whenever I went in the city with my wife and son, I was looking the square of Prishtina and I was seeing all the time international minigolf players walking on the parade, same as I did it in Istanbul 2011 or Bud Munder 2012. I could not wait to see as many countries as possible walking in my city and making my dream come true. Having our national guard leading our parade, and being followed by President of EMF and WMF then our national flag, Albania, up to United States Team, who took part in European competitions for the first time in fifteen years has made my day and my life, and that was the moment when people started to believe that WAGM 2016 it is coming to be true, because many of them did not believe that we could do it. People in the city, they had chance to see fifteen different countries, including New Zealand from another hemisphere, walking on the parade, which was in fact first sport parade in my city. The second main route in Prishtina was blocked by the police just because of the participants of the WAGM 2016. I was waiting at the opening doors with deputy President of the Federation, Bahri Asllani, and I remember he was saying to me, �well it is started, Lavdim, it is started.� I was very stressed in every moment since the parade started because I was looking to see the end of the event, being afraid that we can have rain at any moment, which really open happened for a short time, and this scared me to the death. I thought the event had gone, and I need to dream doing it in the future. MGN: Were there some parts of the event that didn�t go as well as you hoped? LZ: The thing that didn�t go well was that some of the sponsors withdrew their support and we did not have money prize for any category, which I still feel sorry about. MGN: The course in Prishtina, it is the most incredible place to play minigolf. Until you get there, it doesn�t look real. Who came up with the idea and design for it? LZ: I remember when Johnny Nielsen, international manager of City Golf Group, came from Sweden in Prishtina to give his suggestions to Dino, who did not like any of the proposals. He asked him to stay two more days in Kosovo, so he could stay awake all night and think about the course in which way it should be made. And after 48 hours, Dino came with the idea to take many of famous golf courses from USA and Europe, and made them proportionally in miniature, so from above, the course would look exactly like golf course. Some of the courses, he played by himself, like the Sawgrass course in the US from where he took hole no 17 which is one of the most famous is the world up to three stages from Saint Andrew, including hole 13, which is 62 yards long. The idea was accepted by Johnny and soon City Golf Group started their work. I remember we worked some 8 months with an average of 16 workers in order to make and finish the place. It does not look like real at first sight, but when you enter inside, it�s a piece of paradise in Republic of Kosovo. MGN: What did it mean to you to see many homegrown players, such as Vullnet Mustafa and Liridon Mehmeti, perform so well? LZ: I had confidence that the Kosovo Team A was very strong and we can challenge the strongest teams in the world on our course. I had promised this in 2013 in TV SHOW called Flladi Veror in local Television KTV (it still appears in YouTube), and I said only Germany, Sweden, Switzerland and Austria can challenge us. Vullnet had played many tournaments, he played in two national tournaments and many others abroad, in Germany, Turkey, Hollande, Great Britain, Czech Republic and because he is still junior, I was excepted it from him and his brother, but Liridon Mehmeti did something remarkable. Liridon has played before only in friendly match against Croatia in 2012 and Kosovo Open 2012. He came in the top three players in men�s category, and also as a part of Kosovo first Team with Vullnet, Nderim and Burim Nokshiqi who won bronze medal, giving me a huge satisfaction for all the dedication I have made since 2010. It was incredible, we beat Austria as third country in the World to make a huge achievement which I am sure it will go a long time until someone else in Balkan will do it. I was satisfied with all the players. With our Senior players, Riza Tha�i, Izedin Tha�i and Agim Keka. Ylli Morina, Ajet Kameri, Amir Zhegrova, Riad Arifi and Gentian Rizaj. They all averaged under the par of 64, and this was my promise that I made it in the project in 2014. There was nobody from local players who could just played to make a number, but everyone was better and better than each other. This has made me very happy, and this was one of the points I was looking up to fulfil. Best results at the course were from Vullnet Mustafa (47) and Liridon Mehmeti (48) and the other best results from players from abroad were at least 50. This is another thing that I will remember from that game. MGN: Tell us about how the singer Rita Ora nearly came to open the event. LZ: For those who don�t know, Rita Ora is from Prishtina and she is Albanian girl who moved in London in her childhood moments, and yes, I was trying to bring Rita in to make the official opening at the course, since she is Albanian and the Championship WAGM it is founded in United Kingdom. My uncles friend, Keni Kika, who lives in London, he is a close friend of Rita�s father, whose name is Besnik. Keni spoke with Rita�s father and the idea to bring Rita to the course, at beginning was accepted, but she had to do some important work in US and I have totally understood her. She is very simple girl, she made her video song �Shine Ya Light� in the streets of Prishtina and I knew that she could come if she would be free, but hopefully this can be real in the next Championship in Kosovo, which I don�t know when can it happen but it will happen one day. I hope we will have more local and international players than we have had in WAGM 2016. I would love to thank to all the participants who made WAGM 2016 a huge event and experienced Republic of Kosovo. It was a pleasure to be in everyone�s service.